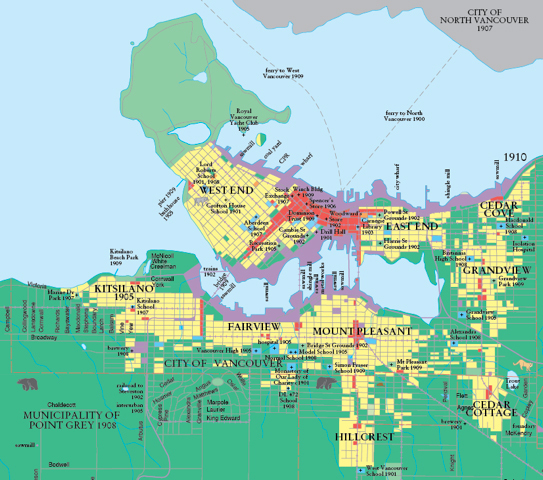 We have lost sight of the social, economic, and environmental values embodied by the tradition engendered in the urbanism of the Vancouver Historic Quartiers. If we have forgotten how to look at the city, perhaps it is because we are driving by too fast, or because we are labouring under the false nihilism of the ‘Degree Zero’ doctrines of Modern urbanism. Everywhere we turn in the Historic Quartiers we discover another place, another space, another set of architectural elements honed to embody the values of community, and the values of place. Thickly encrusted by layers of benign neglect, here in our oldest and most venerable places, we can recover the longest, continuous tradition in urbanism, and secure a sustainable future. Prior to the arrival of railway, Gastown was as a one-street commercial district serving the Hastings Mill population, and all who arrived over the False Creek bridge from New Westminster, or by boat to any of its rickety floats. With the first railway station located immediately to the west, and the surrounding land a timbered wilderness, Gastown was the first beneficiary of the forces unleashed by the transcontinental. Inside the urban room we stand in a space in the city where we can see the buildings all around. It is a place where the linear tyranny of the street is finally broken, and where the distance separating the buildings can be set to resonate with the mechanisms of human sense perception. When the ratio of the building height, to the distance between the buildings can be described by small, whole-numbers, then a powerful and lasting impression is created in our memory that we term the urban room. In the long streets of cities platted with regular orthogonal grids one place can look very much like another. In sharp contradistinction, the experience of the urban room is something altogether different.